Under the deep, dark crush of wrong-headed environmental decisions that have been coming out of the White House virtually every day since January 20, our fair city keeps on shining bright. On Tuesday, Santa Barbara became the 30th city in America to fully commit to renewable energy. 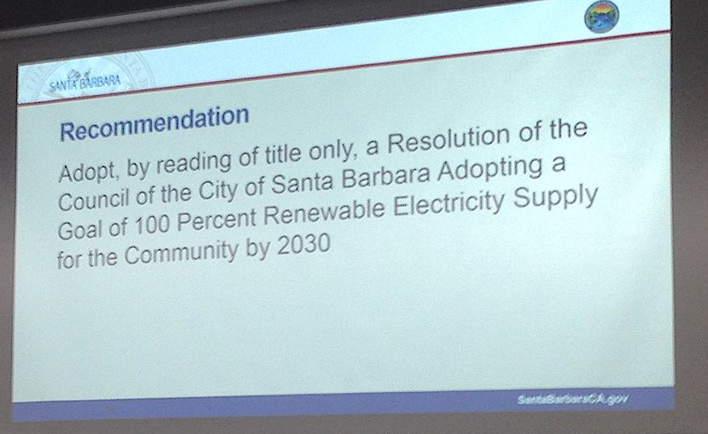 By 2030, our city will use 100 percent renewable energy, based on a resolution the Santa Barbara City Council overwhelmingly approved, on a 5-1 vote, with Councilmembers citing the national political situation as one of the factors that has boosted engagement on local issues of global significance. The vote came after a long public comment period, in which dozens of sign-carrying community residents and civic leaders showed up to speak in support of the 100 percent renewable resolution and on behalf of the planet. The World Business Academy is proud to have been there to help represent the cause, lead by the oral testimony of our Founding President Rinaldo Brutoco and the Academy’s Director of Energy Research Robert Perry. We all should be eminently proud of our compassionate, engaged citizens and deeply grateful to our willing city leaders. Enacting this renewable energy initiative will not come easily—it will take dedication, hard work, and technical expertise, to move Santa Barbara from a city that today gets only a fraction of its energy indirectly from renewable sources to a place where, in just 13 years, literally 100 percent of our energy will be renewable. Together, as a community, we can do this – the Academy is here to help and to make this beautiful community a global example of our common energy future.